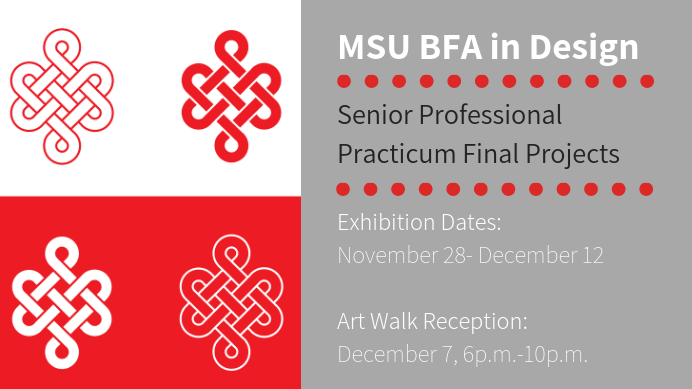 MSU Student Exhibition Center presents MSU Design Students Final Project Exhibition. By the end of the senior year, each student from the Design Program must participate in the Final Project Exhibition. For their final project, each student will work with an actual nonprofit group or business to develop and execute every stage of a design assignment – from concept to delivery. The exhibition usually includes printed pieces, supplementary research sketches, proofs and whatever else students select as a proper representation of their professional execution of an assignment. Exhibition runs from Nov. 28–Dec. 12. Reception will be hosted on Dec. 7, 6-10 p.m. during the First Friday Art Walk. Food and refreshments will be provided during the event.